GLENDALE, ARIZONA – Arizona Coyotes General Manager Don Maloney announced today that the Coyotes have signed 2014 first round draft choice Brendan Perlini to a three-year entry-level contract. As per club policy, terms of the contract were not disclosed. The 6-foot-2, 205-pound Perlini registered 34-37-71 in 58 games with Niagara (OHL) in 2013-14. He led the IceDogs in goals and finished second on the team in scoring. He was also named the most sportsmanlike player on the IceDogs last season. The 18-year-old native of Sault Ste. Marie, Ont., recorded 3-1-4 in seven games and won a bronze medal with Team Canada at the 2014 U-18 World Championship. 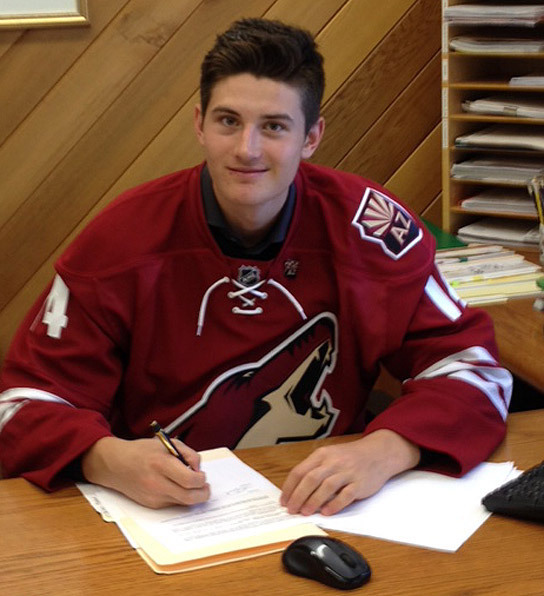 Perlini was selected by the Coyotes in the first round (12th overall) of the 2014 NHL Entry Draft. EDITOR'S NOTE: Click here to watch the latest interview with Brendan Perlini from the 2014 Coyotes Prospect Development Camp.